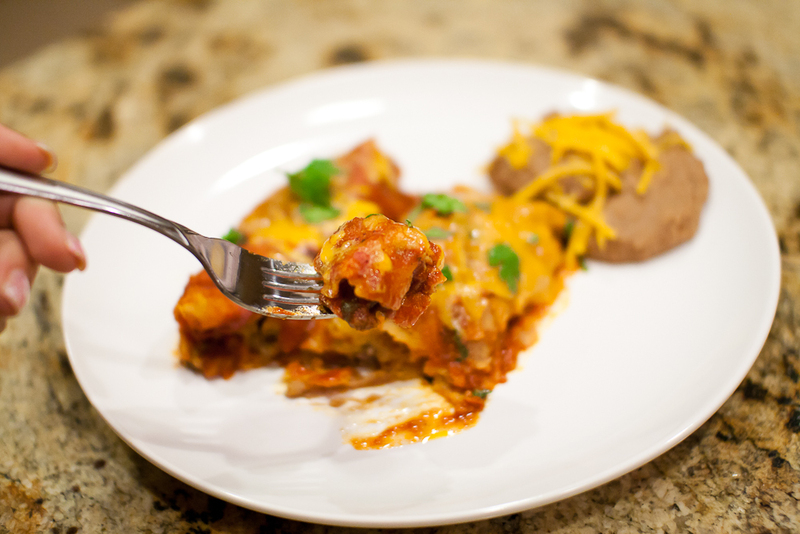 If you’ve been reading my blog for a while, you know that I’m a big fan of The Pioneer Woman, and I love trying new recipes from her blog and cookbook. Last night I decided to try my hand at making her enchiladas. 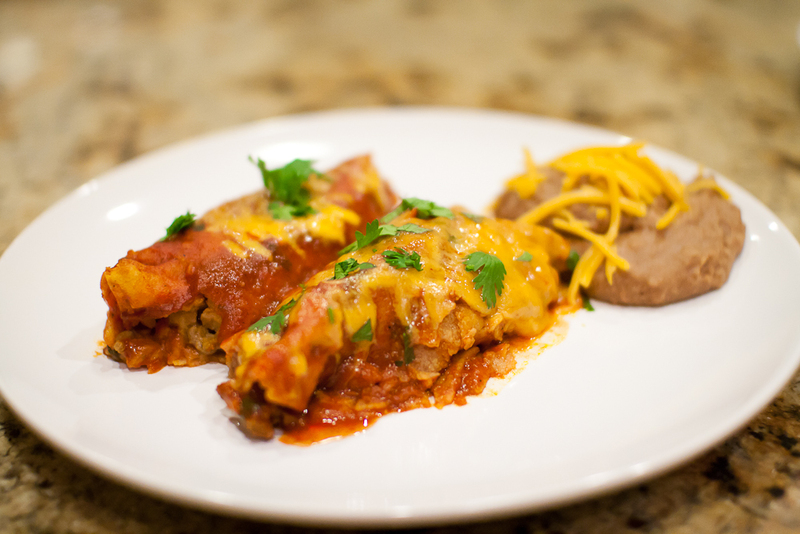 I was a little surprised when I realized that I had never made enchiladas before. Of course, my mom made them a few times when I was growing up, and I’ve had them at restaurants before, but I had never made them myself. This recipe looks complicated, but it’s really pretty easy. 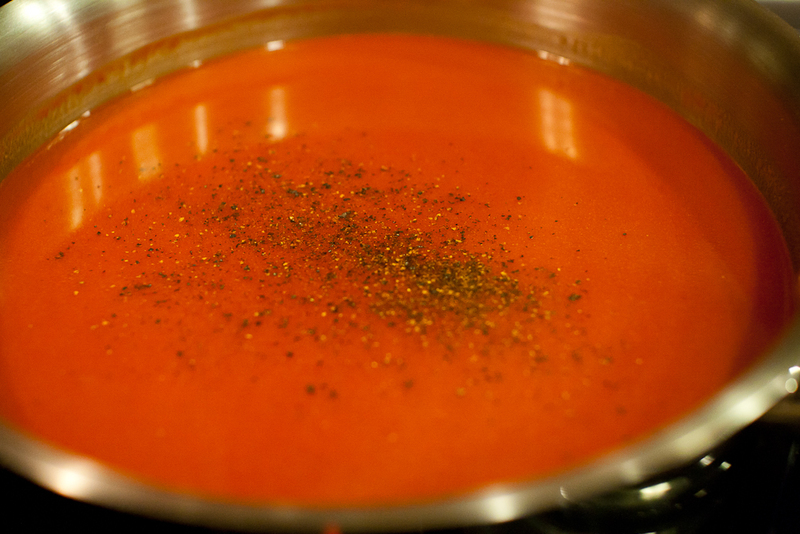 Start with a tablespoon of canola oil in a sauce pan, along with 2 tablespoons of flour over medium-high heat. Don’t make the mistake I did and use a sauce pan that is too small. You’re going to need one that is big enough to hold a 28 oz can of enchilada sauce, plus 2 cups of chicken broth, so plan accordingly. 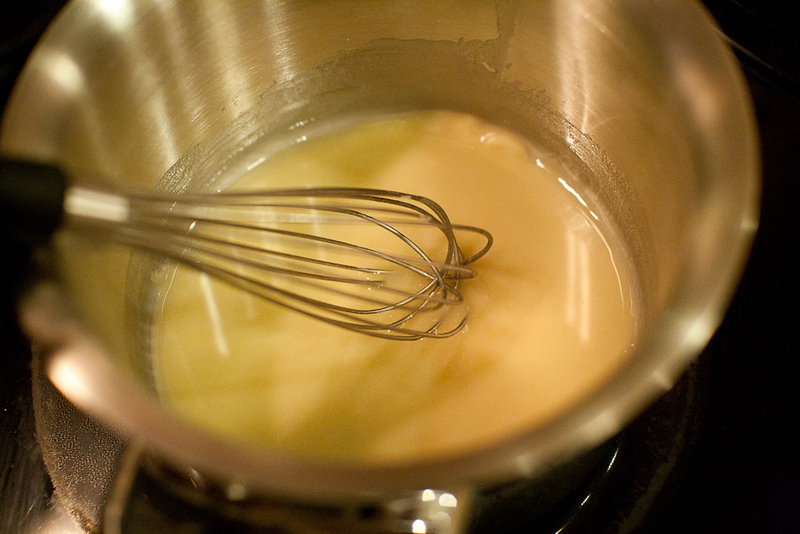 Whisk oil and flour together and let bubble for one minute. 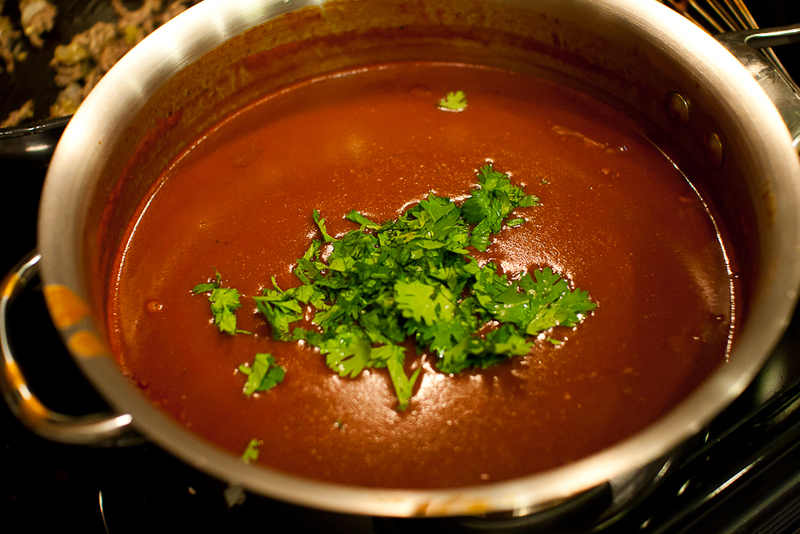 This was the enchilada sauce I used….because it was the only enchilada sauce I could find in my grocery store. If you have another brand you like, go for it! 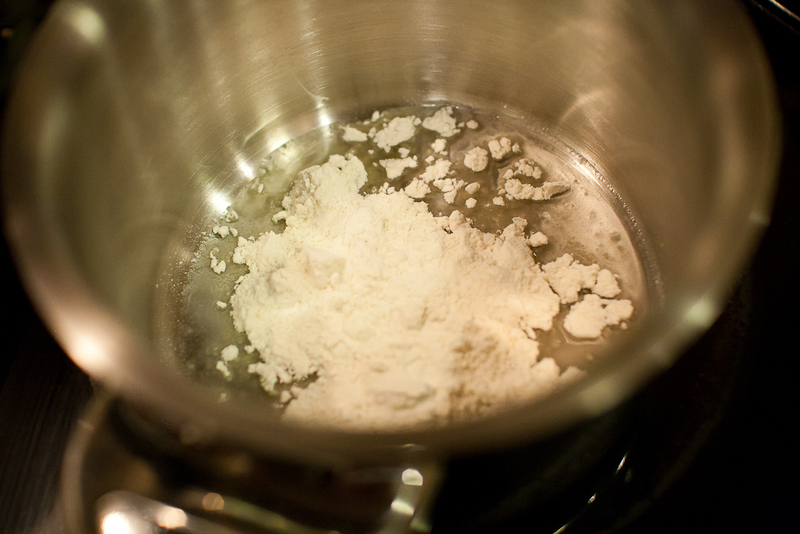 Pour sauce into flour and oil mixture and stir. After I poured this in and looked over at the 2 cups of chicken stock waiting for me, I realized I needed a bigger pot. So I transferred the sauce in to a much more appropriate pot, and proceeded to add the chicken stock (or broth if that’s what you have). Season with salt and pepper and give it a stir. 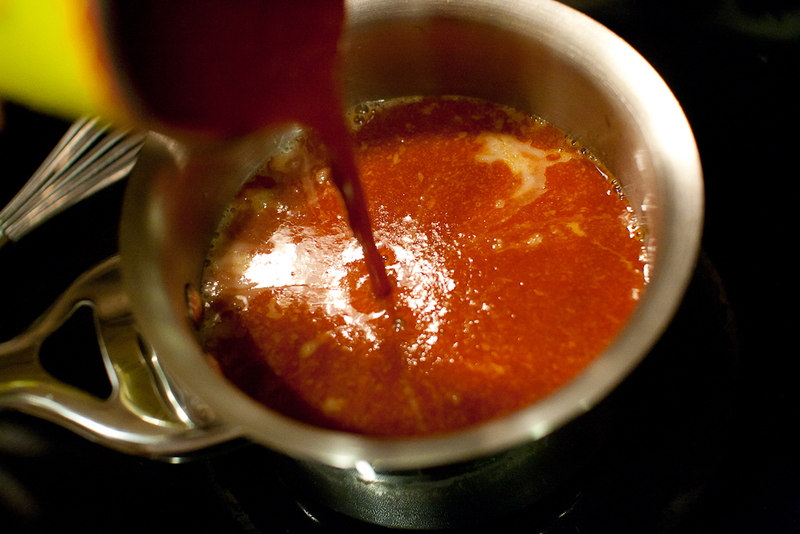 Bring the sauce up to a boil, then lower the heat and let it simmer while you prepare the rest of the food. 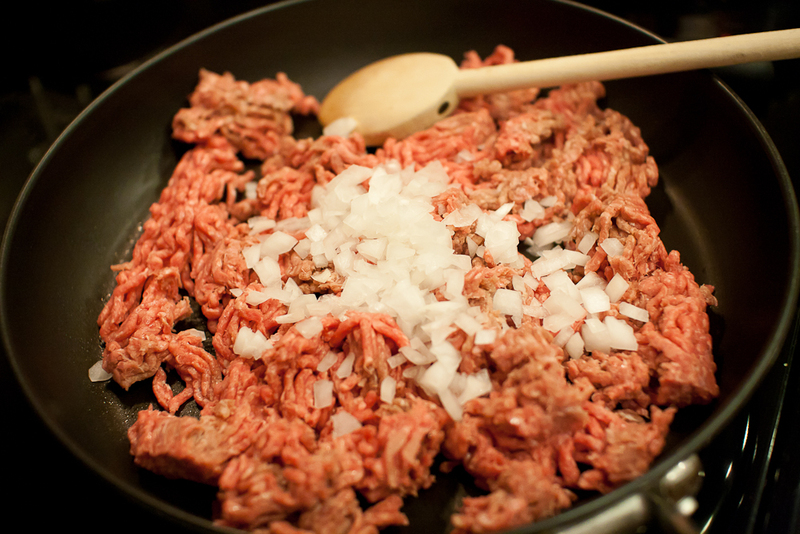 Chop up some onion and add it, along with the ground beef, to a large skillet, and cook until browned. 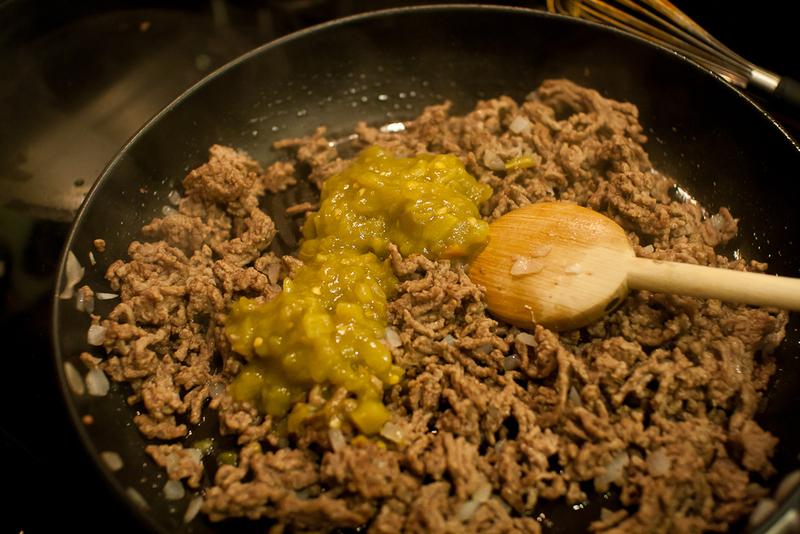 When your meat is browned, drain the fat, then add the green chilies. 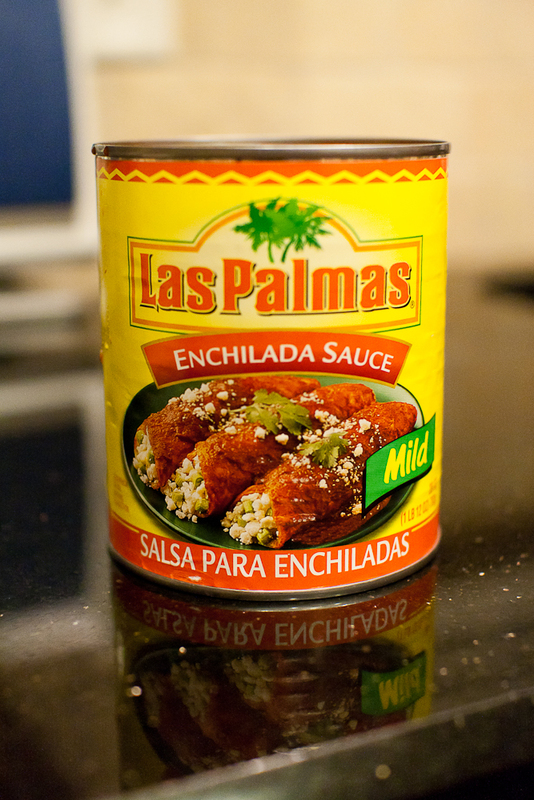 The recipe calls for 2 cans, but I only used one since I didn’t know how we would like it. 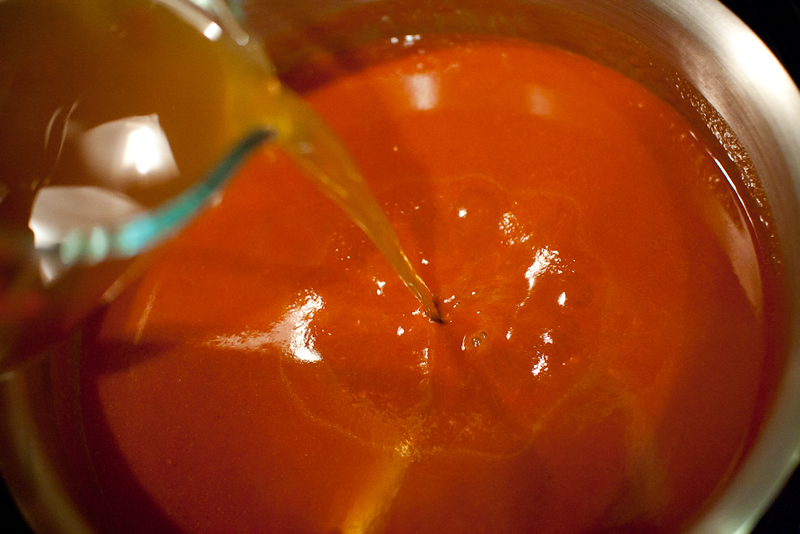 Give the chilies and meat a stir until it’s well combined. Then, turn off the heat and set aside. 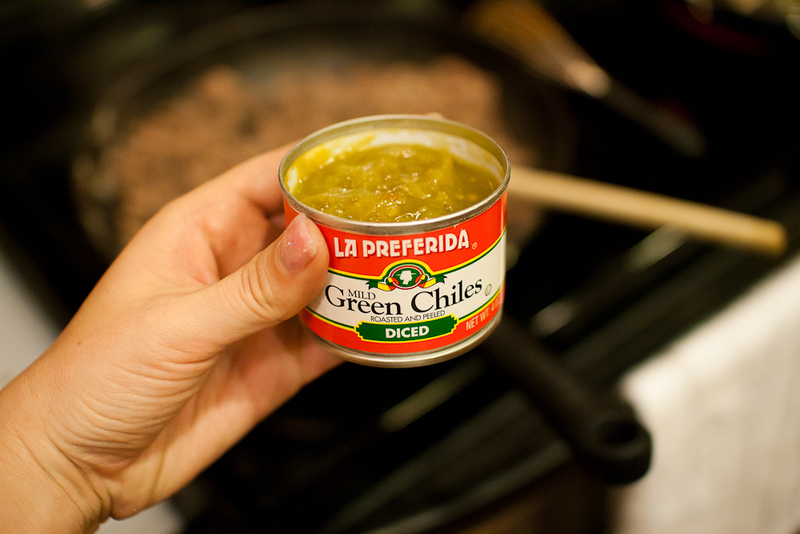 Here’s what the can looked like in case you’ve never bought green chilies before. I hadn’t. Here comes the fun part, frying the tortillas! 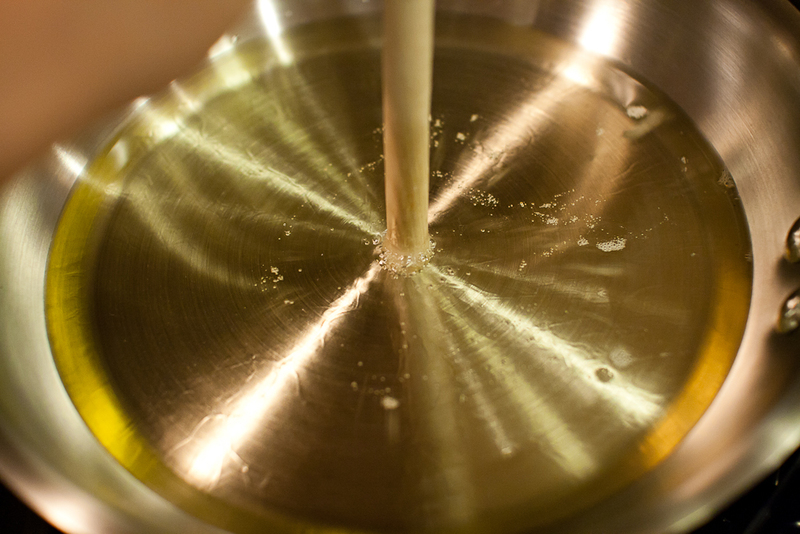 Coat the bottom of your pan with canola oil. I fill it so that it’s about a centimeter high. 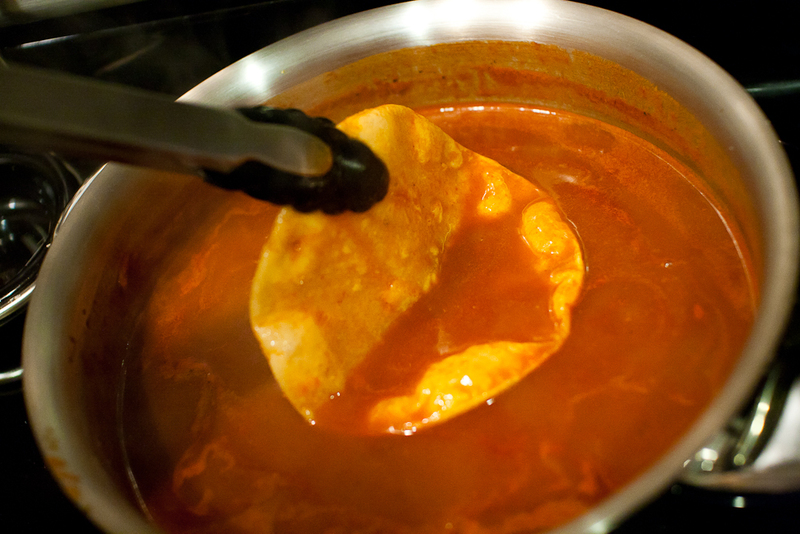 Enough so that your tortilla can be thoroughly submerged. 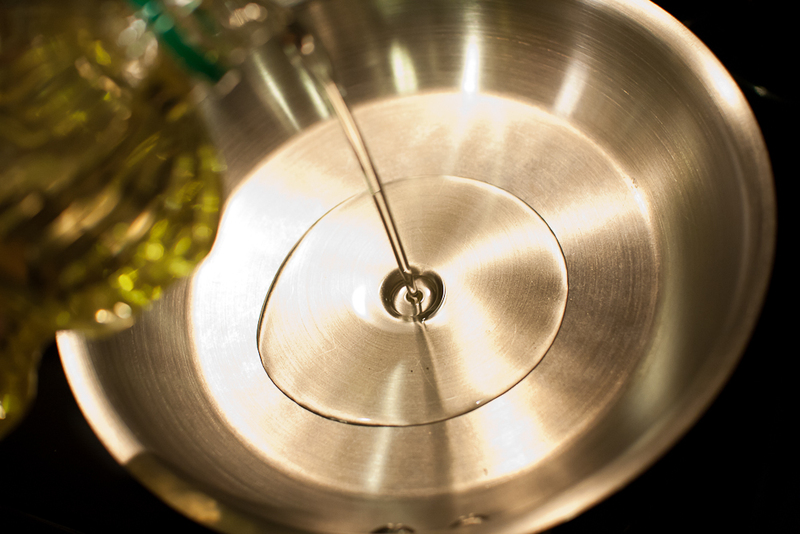 You’ll know your oil is hot enough for frying when you stick the end of a wooden spoon in the oil and little bubbles form around it. 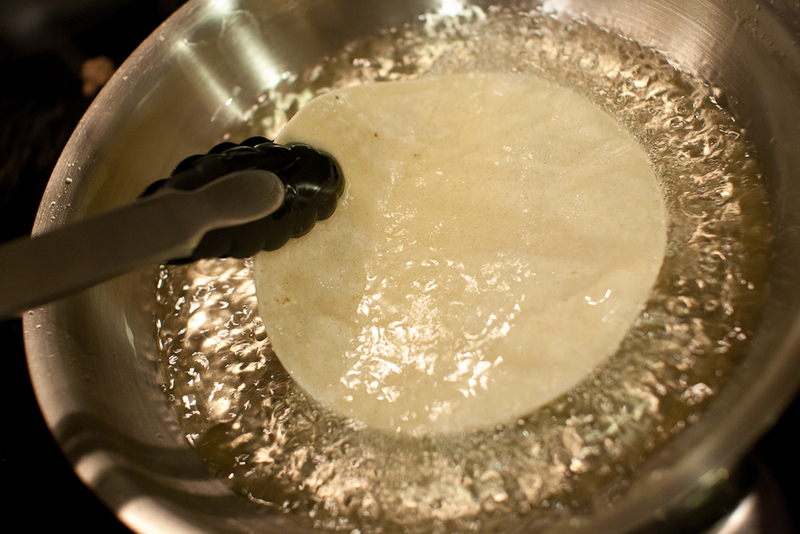 Fry your tortillas just long enough so that they are soft and bendable. You don’t want them to be crispy like you’re making tacos. 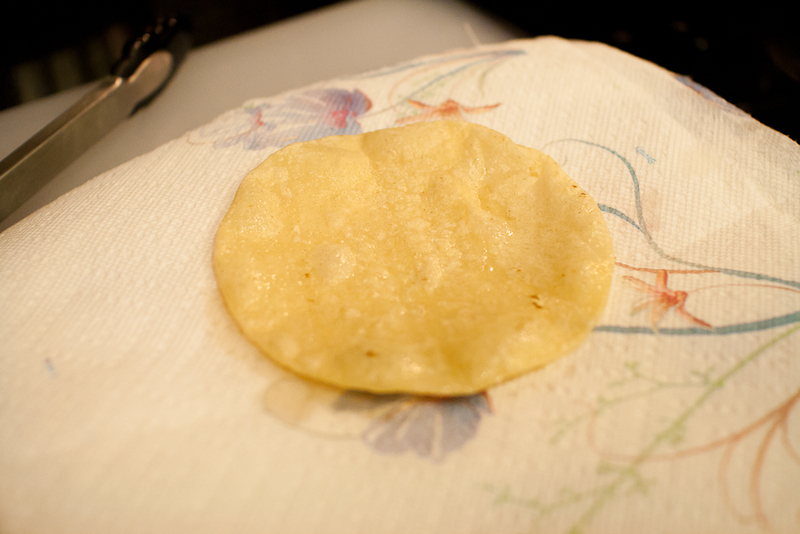 When you’re done frying a tortilla, lay it on a paper towel-lined plate, and put another paper towel in between each tortilla. 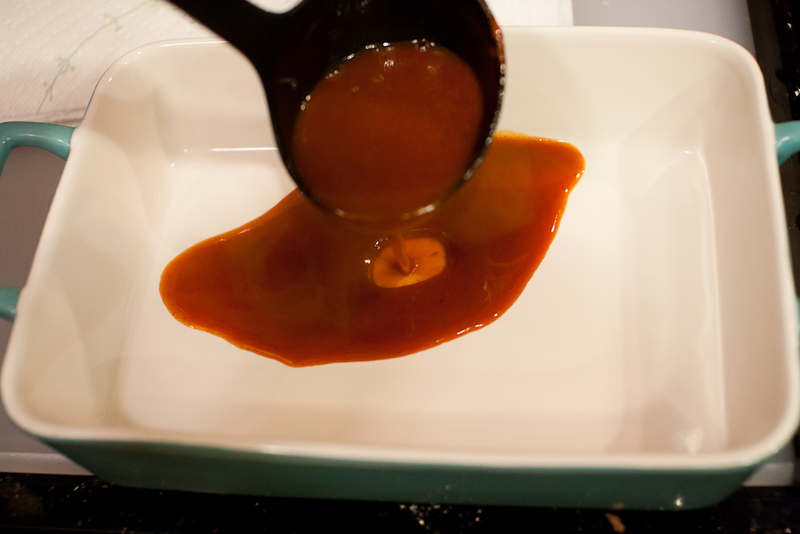 Pour some sauce in your baking dish, enough to cover the bottom. 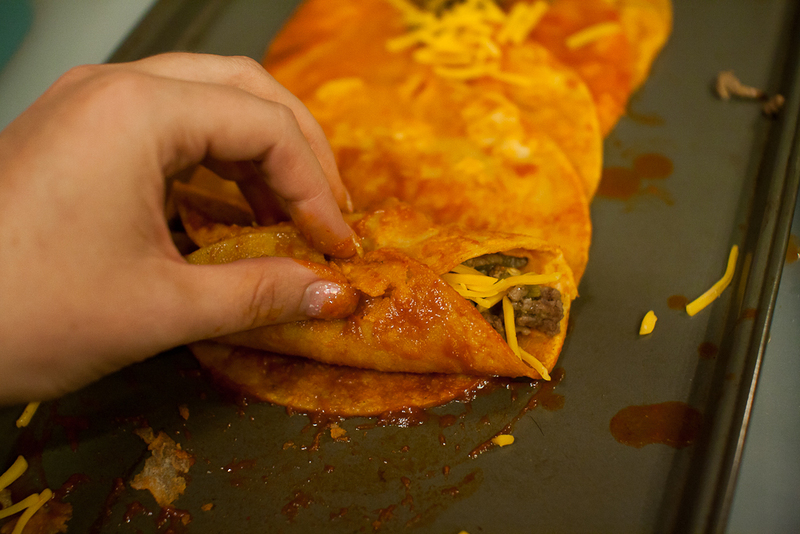 Dunk each tortilla in the sauce, then lay on a cookie sheet. 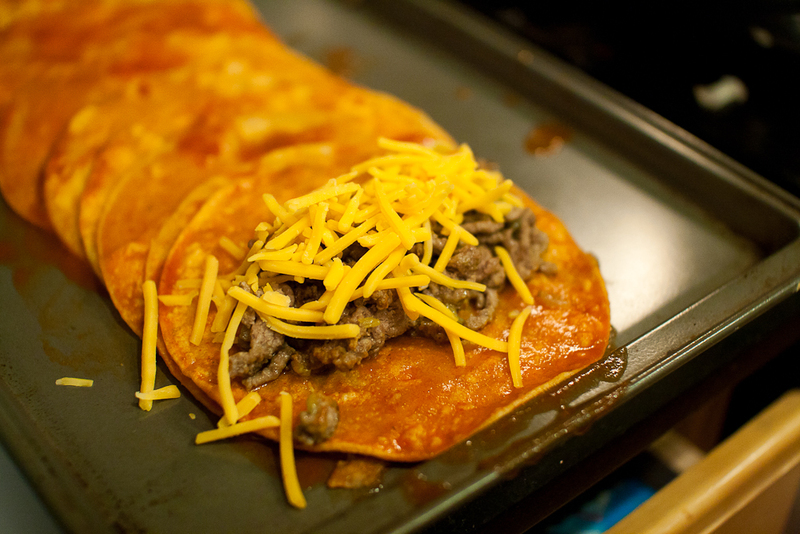 Fill tortillas with meat and cheese. You can also add re-fried beans (like I did), olives, or green onions. Whatever floats your boat. Just don’t fill them too much or you won’t be able to close them. Fold the tortilla closed, leaving the ends open. Place seam side down into your baking dish. It’s ok if they fall apart a little. It’s going to be covered in sauce and cheese so no one will know! It’ll be our little secret. Add some chopped cilantro to the sauce, and stir. 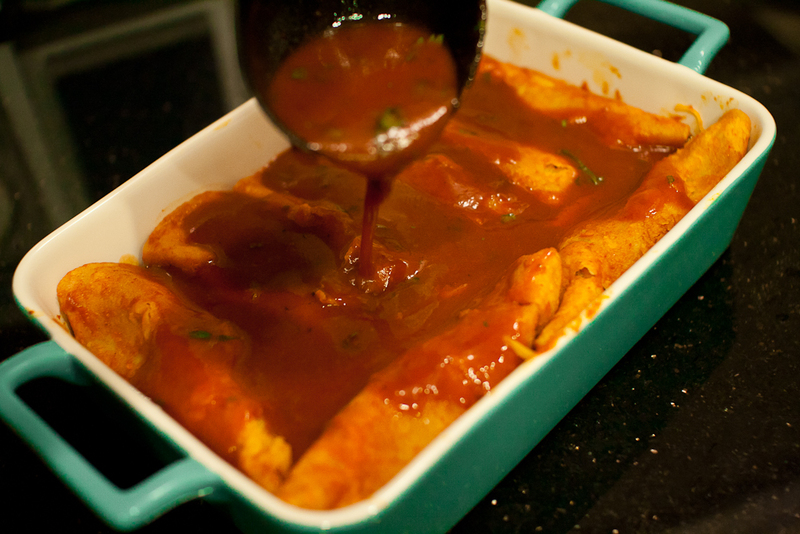 Pour the sauce over the enchiladas so that they are completely covered. 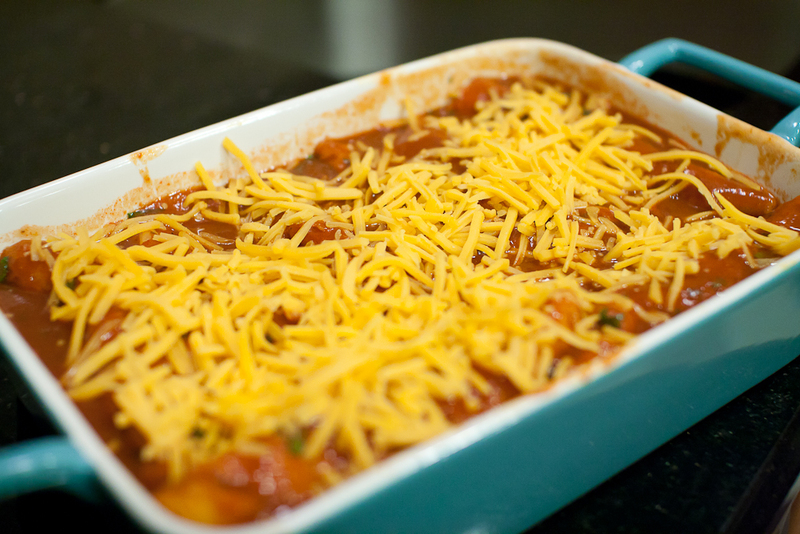 Sprinkle a generous helping of cheese on top of the enchiladas. Look at that yummy goodness! Bake at 350° for 20 minutes, or until nice and bubbly. Sprinkle some cilantro over the top, and you’re ready to serve! Don’t these look delicious!? 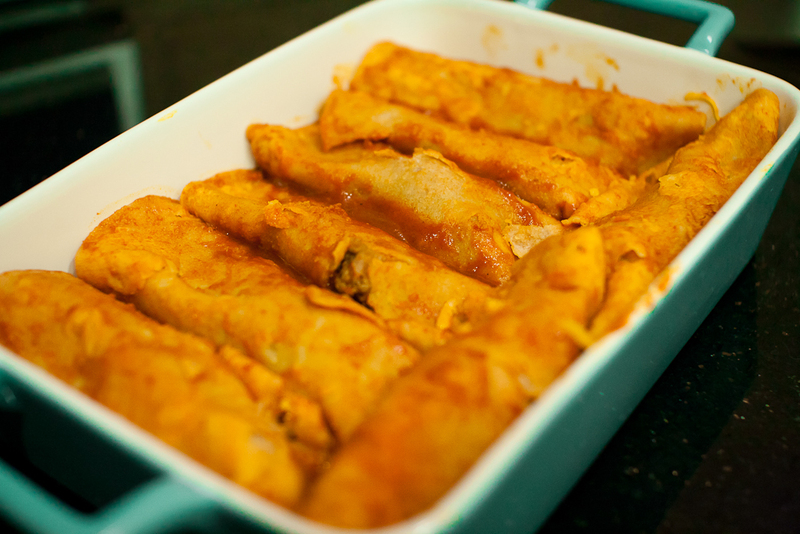 Add a little hot sauce and cheese to some re-fried beans and use as a side dish. Go ahead, take a bite. You know you want to! So cute, your last comment. You made it so easy with your step by step instructions.! Thanks!!! 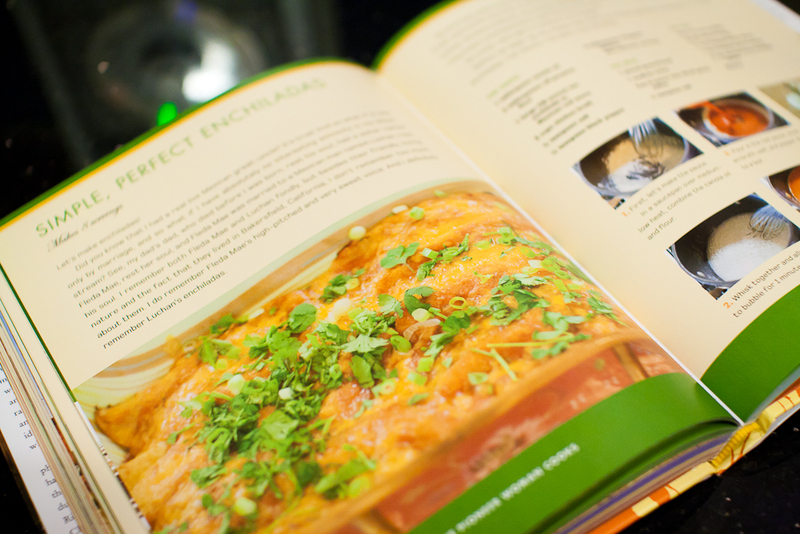 I love her cookbook too! I haven’t made this recipe yet though, but now you’ve made me want too!! Oh good! You should definitely try it! I had my husband go through the cook book and write down which recipes he really wanted to try, and this one was on the list, so I thought I’d better make it! Hey Mom, actually, Steve’s brother and sister in law gave us that blue baking dish, but I was using the pans you gave us! I just made those the other day! They were really good! And three out of four of my kids approved! It looks so good! I’m gonna put it on my website so if someone clicks on the recipe it will go straight to your site! Have I told you yet today I love your camera! 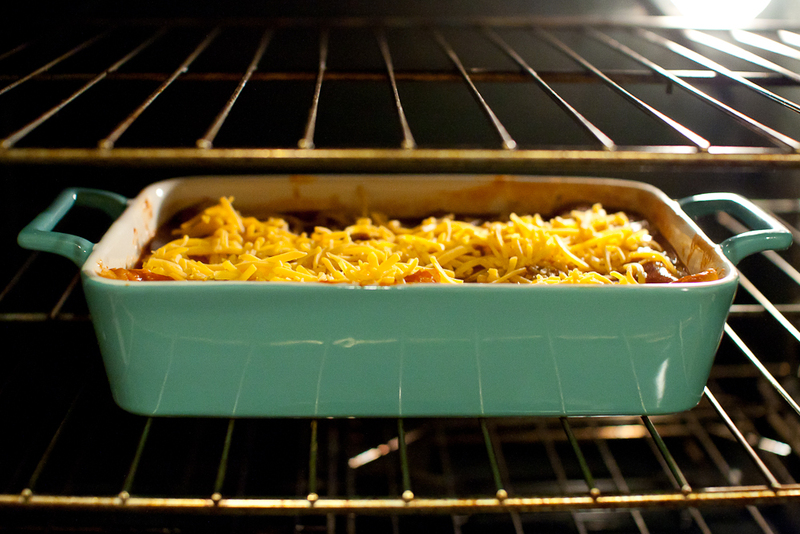 I love that baking dish – gorgeous color and awesome lines. Anyways, I have also made this recipe before and it is delicious. My hubby and I are crazy for Mexican food and have it at least 2x/week. 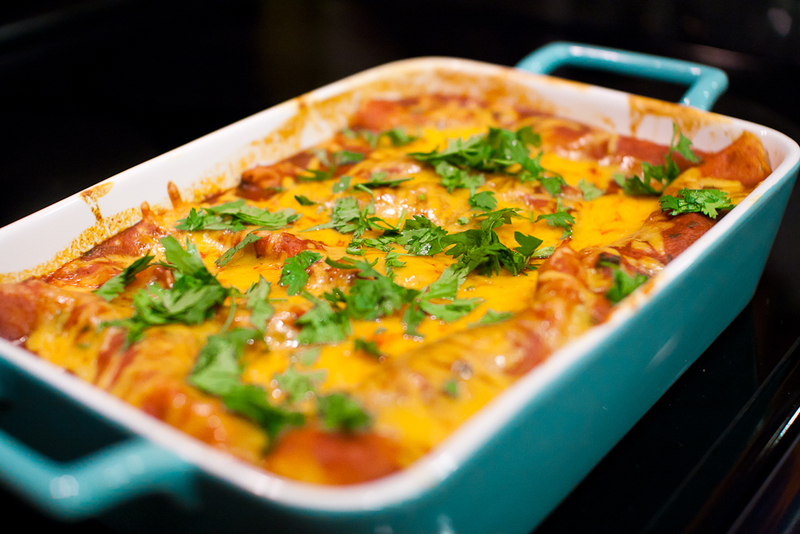 Just made some Buffalo Enchiladas last night…phew, they were spicy but so good! Ha! I guess I got mixed up because I ordered so many items from the two store registries and had them shipped. . . .I really thought we gave those to you! Sorry! 🙂 They ARE very pretty dishes.